Last fall on a particularly windy day, I was blowing leaves into an adjacent lot that I own when I realized something: this labor seems futile. I would blow the leaves and get a favorable wind and then, just as quickly, another wind would come up from the opposite direction and push the previously-blown leaves right back at me. I have felt this same futility in managing my Type One Diabetes for the last thirty seven years. I continue to push ahead even through complications such as near blindness in my right eye. I press on, however, not because of a prideful sense of accomplishment, but the alternative to letting go would be death. The apparent futility of both of these situations remind me a lot of the dailyness of the Christian life, especially in the workplace. How often do we feel as if our efforts to live the Christian life in spite of opposition, hard circumstances, little recognition, etc. are futile at best? An irate boss? A troublesome co-worker? Loads of work that seem to increase minute by minute? Constant ridicule for our love for Jesus? Often, all we are left with is our well-versed theology that these circumstances are a result of the Fall. Correct. However, in the midst of these troublesome things, we look for some greater meaning to combat the futility. In the third chapter of Philippians, Paul must have had a sense of these frustrations in the church at Philippi as he penned this letter. He admonishes the believers to “rejoice.” He counted earthly gain as “loss” to know Jesus. Several times, he states that he is “pressing on” for a future reward. He finally states that the believer’s citizenship is in Heaven. So is our reward. In all of his letters, Paul never sugar-coated the struggles and plight of believers and neither should we. He gives NO easy solutions. Just like blowing leaves or managing diabetes, there is no easy solution to the never-ending struggles that we face in our faith, either. In the workplace, in our homes, even in our churches, we press on, looking forward to our seeing Jesus for eternity. We believe from the Bible that He will never leave or forsake us. We also live out the Christian life in community, hand in hand with other believers who struggle in this life through tough circumstances and tensions in the Christian life. I finally finished the yard, only to repeat the process again. Again, I tackled the yard with the leaf blower. This time, however, my neighbor across the street came and helped. Together, the job went much faster. Image by Piers Nye. Used with permission. Sourced via Flickr. Post by Dr. Drew Randle, Professor of Christian Ministry at Bryan College. Entrepreneur says work would be too hard if he didn't see it intrinsically as an act of worship. Explore some common causes of workplace anxiety, and solutions from the Bible. The demands, pressures and stress of work can put a huge strain on relationships with our coworkers. 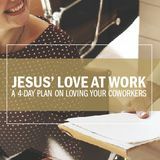 This 4-day plan from Theology of Work Project and Workmatters provides simple steps you can take to be more loving to your coworkers that will transform those relationships and increase both joy and productivity at work. By Drew Randle. Published by The High Calling, January 31, 2013. Image by Piers Nye. Used with Permission.